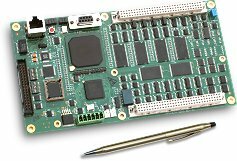 The MultiFlex ETH 1440 Ethernet motion controller is designed for high-performance multi-axis applications which require up to 4 axes of analog servo control and up to 4 axes of stepper control. Optional encoder inputs for closed-loop stepper control and general-purpose analog inputs are also available for this model. 16 uncommitted bi-directional opto-isolated inputs with individually configurable supply & return: 5 to 24 Volts; for functions such as ± limits, home and amp fault inputs. 12 uncommitted open-collector outputs (sinking up to 100 mA): 5 to 24 Volts - for functions such as amplifier enable/disable, full/half current, step/microstep, etc. 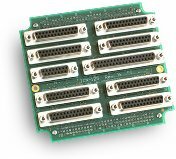 ICN-100 Plug-on SCSI interconnection board features 4 x 68-pin high-density SCSI connectors that are 100% pin-compatible with the MultiFlex PCI Series connectors. Provides a fast and convenient way to connect to external wiring terminal boards, such as the ADAM-3968. 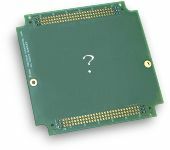 The ICN-100 is ideal for bench-top prototyping or for users who wish to substitute a MultiFlex ETH 1000 series controller for an existing MultiFlex PCI 1000 series controller without any wiring changes. ICN-120 series plug-on D-sub interconnection boards allow users to connect directly to external devices such as motor drives, limit switches and encoders via low-cost D-subminiature cables. ICN-125: Use with MFX-ETH-1800-0, -1800-2, -1840-0, -1840-2 or with -1440-0, -1440-1, 1440-2, 1440-3 if more than 16 (up to 32) opto-isolated axis inputs are required. ICN-126: Use with MFX-ETH-1080-0, -1080-1, -1080-2, -1080-3. ICN-130 DB25-to-screw-terminal board for use with the ICN-120 series and ICN-125 D-sub interconnection boards - provides quick and convenient connection to 1 servo axis and 1 stepper axis of I/O. Can be plugged directly onto ICN-120/125 D-sub interconnection boards, or can be located remotely and connected via standard DB-25 extension cables such as the CBL-DB25-x cable. Shielded 25 conductor DB25 Male to DB25 Female straight-through extension cables for use with the ICN-120/125 D-sub interconnection boards and ICN-130 screw terminal board. 1 servo axis and 1 stepper axis per cable. Shielded 68 conductor HD68-to-HD68 SCSI cables for use with the ICN-100 SCSI interconnection board. Up to 2 axes of I/O per cable. PWR-100-48 Optional DC-to-DC converter module plugs onto MultiFlex ETH 1000 series controller board and allow users to power the controller with a single DC input supply voltage. To reduce wiring cost and complexity, I/O interconnection boards can be plugged directly onto the controller. This eliminates the need for cables between the controller and I/O interconnection board which results in better reliability and reduces material and assembly costs. The ICN-100 SCSI interconnection board features industry-standard SCSI connectors that are 100% pin-compatible with the MultiFlex PCI series controllers - ideal for prototyping or for customers who wish to quickly substitute a MultiFlex Etherent controller for an existing MultiFlex PCI controller without any wiring changes. The ICN-120 series of D-sub interconnection boards are designed for users who wish to eliminate point-to-point wiring and build their own cables to mate directly to external devices. Users can also design a Custom plug-on interconnection board to meet their particular needs. Description Plug-on SCSI interconnection board - MultiFlex PCI pin-compatible. 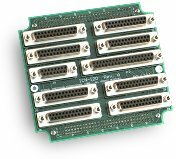 Connections Four HD68 SCSI connectors that are 100% pin-compatible with the MultiFlex PCI series controllers - ideal for prototyping and for users of the MultiFlex PCI Series. Additional 37-pin and 15-pin Female D-sub connectors provide an alternative means of accessing the 32 general-purpose digital TTL I/O and 8 optional analog inputs. 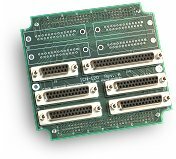 Use With Any MultiFlex ETH 1040, 1400, 1440 and 1802 motion controller with ADAM-3968 wiring terminal board and SCSI cables. Not compatible with MultiFlex ETH 1800, 1840, and 1080 models. Description Plug-on D-sub interconnection board for applications with up to 4 analog servo AND/OR 4 open-loop stepper axes. 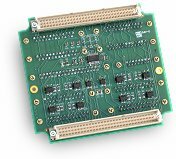 Description Plug-on D-sub interconnection board for applications with up to 8 closed loop axes. Can also be used with controller P/N: MFX-ETH-1040-0, -1040-1, -1040-2, -1040-3, -1400-0, -1400-2, -1440-0, -1440-2. Description Plug-on D-sub interconnection board with 16 additional opto-isolated inputs and 4 additional open-collector outputs (These are provided in addition to the 16 opto-isolated inputs and 20 open-collector outputs offered standard on all MultiFlex ETH controller boards.) Designed for use with MultiFlex ETH 1800 & 1840 controller models. Connections Eight 25-pin Female D-sub connectors for all axis I/O, one 37-pin Female D-sub connector for 32 general purpose digital TTL I/O and one 15-pin Female D-sub connector for 8 optional analog inputs. Use With Controller P/N: MFX-ETH-1800-0, -1800-2, -1840-0, -1840-2. Description Plug-on D-sub interconnection board with 16 additional opto-isolated inputs and 4 additional open-collector outputs (These are provided in addition to the 16 opto-isolated inputs and 20 open-collector outputs offered standard on all MultiFlex ETH controller boards.) Designed for use with MultiFlex ETH 1080 controller models. Use With Controller P/N: MFX-ETH-1080-0, -1080-1, -1080-2, -1080-3. Description Custom-designed plug-on interconnection boards can be easily designed by the user or by PMC. Screw-terminal boards provide quick and convenient wiring connections for prototyping and bench-top testing. Description 25-pin Male D-subminiature (DB25) to screw-terminals. Provides convenient screw terminal access to the 25-pin D-sub axis connectors on the ICN-120/125 series plug-on D-sub interconnection boards. Can be mated directly to the ICN-120/125 series interconnection boards or connected via a standard DB25 extension cable such as CBL-DB25. One board accomodates 1 to 2 axes of I/O (1 servo axis and 1 stepper axis). Connections One 25-pin Male D-subminiature connector on board edge. 1 x 5-place and 2 x 10-place screw-terminal strips on board face. Connections Provides 68 numbered screw-terminals arranged in two rows of 34 for easy access to the individual pins of the 68 pin SCSI cable used with the ICN-100 interconnection board. PMC's interconnection boards are designed to work with low-cost and widely available industry-standard cables. For the convenience of our customers, we offer a basic selection of D-sub and SCSI cables. Note: One cable accommodates 1 or 2 axes of I/O, depending on motion controller configuration. Description Industry-standard shielded 25-pin DB25 Male to 25-pin DB25 Female straight through extension cable. Cable Lengths 3 ft. (~1 Meter) and 6 ft. (2 Meter) cables available directly from PMC. Other lengths are available from third party cable vendors. Use With ICN-120 series and ICN-125 D-sub interconnection boards and ICN-130 screw terminal board. Description Industry-standard 68-pin HD68 ("SCSI-3") Male to 68-pin HD68 ("SCSI-3") Male cable assembly. Via an external regulated DC power supply that provides +5 +12 and -12 VDC directly to the motion controller, such as the triple output power supply shown below. Or via an external regulated DC power supply that provides a single input voltage of 12-70 VDC to the motion controller. This option requires one of the PWR-100 DC-to-DC power converter plug-on modules shown below. Description Optional DC-to-DC power converter plug-on modules allow users to power a MultiFlex ETH 1000 series controller with a single DC input supply voltage. Eliminates the need for a triple-output power supply such as the PWR-522 shown below. Instead, a single 12-70 VDC input is required. Connections Inputs: 2-position Phoenix screw-terminal sockets - 3.81mm (0.150") pitch. Note: The mating 2-position power input connector is included with every purchase of a PWR-100 converter module. Description Triple output power supply - AC mains input (100-120/200-240VAC) to triple DC outputs (+5 & ±12 VDC) required to power a MultiFlex ETH series 1000 controller. Connections Inputs & Outputs: Screw-terminals on power supply. The PWR-522 also includes a wiring harness with screw terminal lugs and CNN-006 6-position Phoenix screw-terminal plug which mates to the power input socket on the controller board. The layout and dimensions of our MultiFlex ETH 1000 seris motion controllers allow users to easily design a custom housing or enclosure to meet specific needs. For users who want to attach the controller to a DIN rail in their machine or simply to hold the board when prototyping on the bench-top, we provide the optional DIN rail mount housing described here. Description Optional DIN rail mount housing. 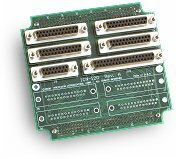 Used to mount a MultiFlex ETH 1000 series controller board to a standard DIN rail or to house a MultiFlex Ethernet controller board when exposed on a benchtop. Includes 1 main extrusion housing, 2 end caps and 4 phillips-head screws. Assembly required. Data Sheet Features & specifications for the MultiFlex ETH 1440 motion controller. Data Sheet Features & specifications for the MultiFlex ETH 1040 motion controller. Part Numbers Part numbers and ordering information for the MultiFlex ETH Series of motion controllers.